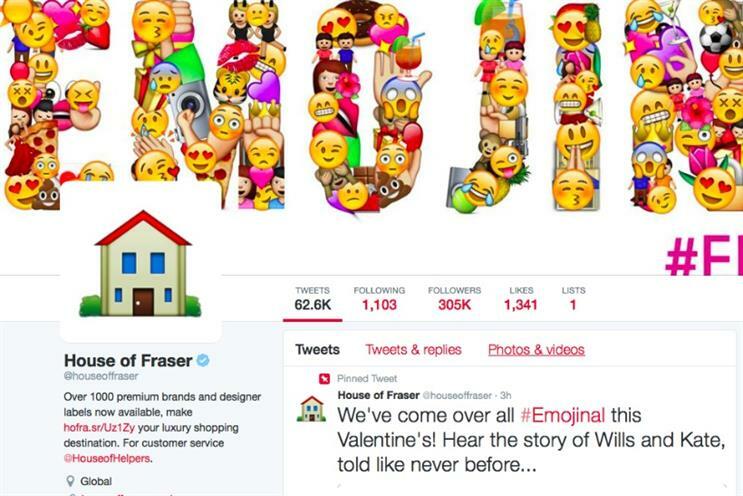 An emoji-filled House of Fraser Twitter campaign has offended some people and is causing users to question whether the account has been hacked. The department store retailer has tweeted bizarre images accompanied by emojis in an ‘#Emojinal’ campaign for Valentine’s day. House of Fraser’s account has tweeted at Kanye West and Kim Kardashian with an image of a peach and a "practice what you peach" caption, while other tweets feature Leonardo DiCaprio with a superimposed emoji trumpet and a strange birthday message for Harry Styles. Social media users have been left baffled by the activity and it has even led to people asking if the House of Fraser Twitter account has been hacked. At one point House of Fraser appeared to suggest the account had been hacked with a "really sorry guys, not sure what’s going on here" message alongside "please bear with us" spelt out in emojis. Really sorry guys, not sure what's going on here... ???? WITH US ?? The campaign has drawn criticism from users, which led House of Fraser to react by implying the user was being boring. This response caused offence with another user, who accused House of Fraser being "disrespectful and rude". @houseoffraser @BigFashionista @LodzTBB responses et al? Really poor. There's funny and witty, and then there's disrespectful & rude. However, the campaign has met with support from some quarters who believe the campaign is only showing the brand’s lighter side. Seems like I'm the only person loving @houseoffraser's emoji takeover ?? IMO it's nice to see companies let loose & have a bit of fun.